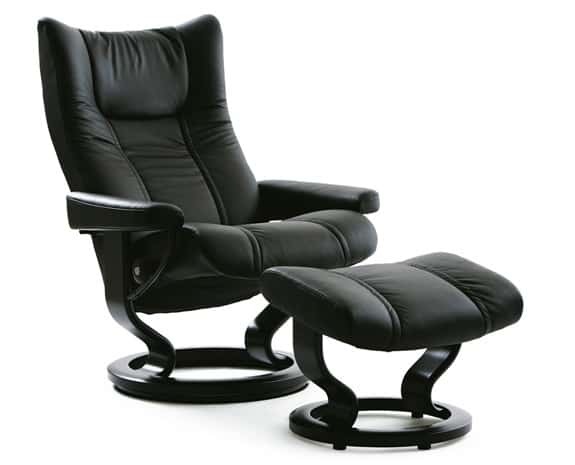 The Stressless Wing (M) recliner dates back to 1994 and remains one of the most popular Stressless designs. The Wing (M) is both luxurious and modern, appealing to a wide range of classic styles. Not only does it look great in any home, the built-in technology and support is second none. Sculpted proportions, plush cushions, and padded armrests deliver comfort at every angle. The patented internal technologies work beneath the surface to provide a high level of comfort and support that adjusts to your body’s positioning. A 360 swivel creates ease of movement to change your view. With a classic look and meticulous engineering, this polished recliner is an essential addition to any home. The Wing (M) is perfect for individuals of average size and statue. This chair offers optimal support for your neck and back to relax in the ideal sitting position. Internal technology responds to shifts in your weight so the lumbar region of your back always has the support it needs. The matching, plush ottoman supports your legs and feet for ultimate full-body comfort. The sleek 360 swivel and sturdy base adjusts your view with ease. Relax in high-class and experience ultimate comfort with the Wing (M) by Stressless. When you choose Stressless ergonomic furniture, you’re taking care of your long-term health by relaxing in a chair meticulously designed to support your back and neck. We ship to any address in all 50 United States. Ask for details regarding shipments to Canada. For quality assurance, all Wing (M) shipments must be insured for accident, loss, or damage. Once your shipment leaves our facility, a tracking number is provided via email. Unless otherwise stated, delivery means “to your door”. Shipments must be signed for by someone over 18 years of age. Expensive but certainly worth it!